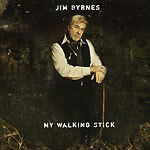 Turbula - Music - Review of "My Walking Stick"
Jim Byrnes combines rough-hewn blues with gospel, zydeco, classic R&B and other influences to offer up a potpourri of sound that is constantly refreshing. The St. Louis native has been based in Canada for decades and releasing music since 1981. He follows up his highly-regarded "House of Refuge" from 2006 with a new release, "My Walking Stick." The new disc features superb production by Steve Dawson, who also did the board work on "House of Refuge." One of the keys to this disc clicking is the material selection. Byrnes wrote or co-wrote three, but the rest include both the familiar and unusual; from traditional gospel to funk, to deep Delta country blues. The inspired choices are played expertly by the studio band, including prominent use by guitarist Dawson of the Weissenborn lap steel guitar, mandotar and baritone guitar. A three man gospel background vocal group is aboard on nine of the cuts and is excellent. "Ol' Rattler” opens up, a Byrne original, and gets the listener acquainted with Byrnes' commanding vocal presence. An actor as well as singer who lays in country affectations effortlessly, Byrnes delivers a bluesman persona. This carries over to other tunes, like the title cut, a 1930s Irving Berlin swing standard. Byrne, a double amputee, gives this one a wicked reading as violin riffs create an exotic atmosphere. "Ophelia" is familiar as The Band tune, remade with gospel singers crooning smoothly over banjos. Other memorable moments include a good covers of "Lonely Blue Boy (Danny's Song)," "Drown in My Own Tears" and the spiritual "I Want My Crown." The latter shows Byrnes' strength  he can sing gospel and make the listener believe it. "One Life (Creole Poetry)" is an original that leaves an impression, a zydeco song with Dawson's guitar evoking haunting tones. "My Walking Stick: offers the listener good songs by a good singer, played by a good band. It's a solid mix.